Bespoke luxury leather jacket brand, NAMESAKE, announced today plans to unveil a robust collection of 13 one-of-a-kind leather jackets in collaboration with top visual artists from around the world. The unveiling will take place at the upcoming season of RE\SET™ 004 at Toronto Fashion Week on Tuesday September 4, 2018 at 6:30 P.M. at the globally renowned LUMAS Gallery, 159 Yorkville Avenue in Toronto, with cocktails provided by SIPBAR and Hop City premium craft beer. Each jacket in the collaboration will be available for purchase with proceeds directly benefiting the global fashion platform, Fashion Revolution, a not-for-profit organization aiming to radically change the way clothes are sourced, produced and consumed by ensuring safe, clean and fair conditions for workers in the manufacturing industry. Halpern worked closely with each artist to bring their combined visions to life, creating unique one-of-a-kind luxury leather jackets to represent each artist’s style, vision and artistic medium. 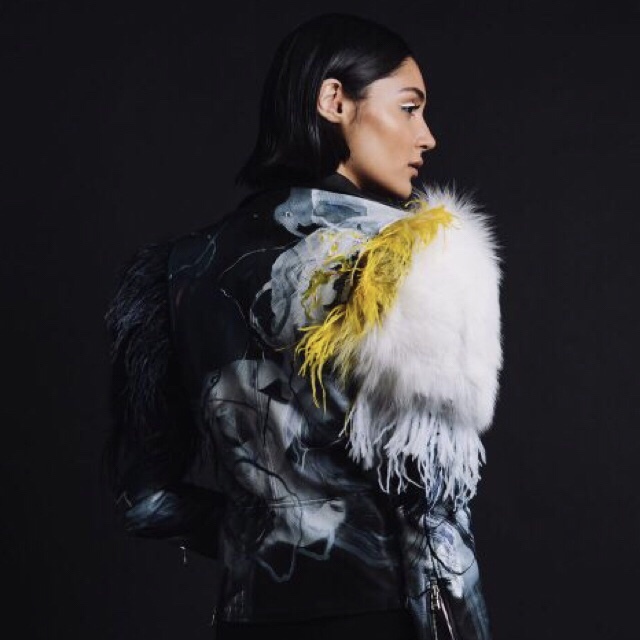 The NAMESAKE Artist Collaboration includes photography printed directly on leather and lining, human hair fringe, bold abstract painting and hand-tattooed leather, among many other creative aspects. The installation of leather jackets unveiled at the LUMAS Gallery on Sept 4 will remain on exhibit at the LUMAS Gallery in Yorkville until Sunday, September 9, with opportunity for purchase at NAMESAKE’s ecommerce platform, www.bythenamesake.com. Jackets will then be presented once again in the oval of Yorkville Village (55 Avenue Rd) for the month of October, allowing consumers and the general public access to see the collection first hand, and engage in supporting this initiative. “I have spent many years in my career working in various parts of the fashion industry where I have seen first-hand the harsh conditions where clothes are made. Now with my own label I have made a conscious decision to support foundations like Fashion Revolution, to help to bring awareness on conditions often overlooked by the consumer. The fashion industry as a whole still has a long way to go but I hope this season’s presentation helps to support change.” Continues Halpern. This entry was posted in Uncategorized and tagged 360, 360 Magazine, Ben Johnston, Bobbie Burgers, Bobby Dunn, collaboration, Daniel Mazzone, designer, fashion platform, Hop City, Janna Watson, LUMAS Gallery, Madison Smushkevich, Namesake, non-profit organization, Paolo Pettigiani, photography, RE\SET, RE\SET 004, Rita Leistner, Sarah Phelps, Sarah Skrlj, Shayla Bond, SIPBAR, Tahsin The Good, Tara Zep, Toronto, Toronto Fashion Week, Vaughn Lowery, visual artists on August 16, 2018 by wp360mag.